CONGRATULATIONS! 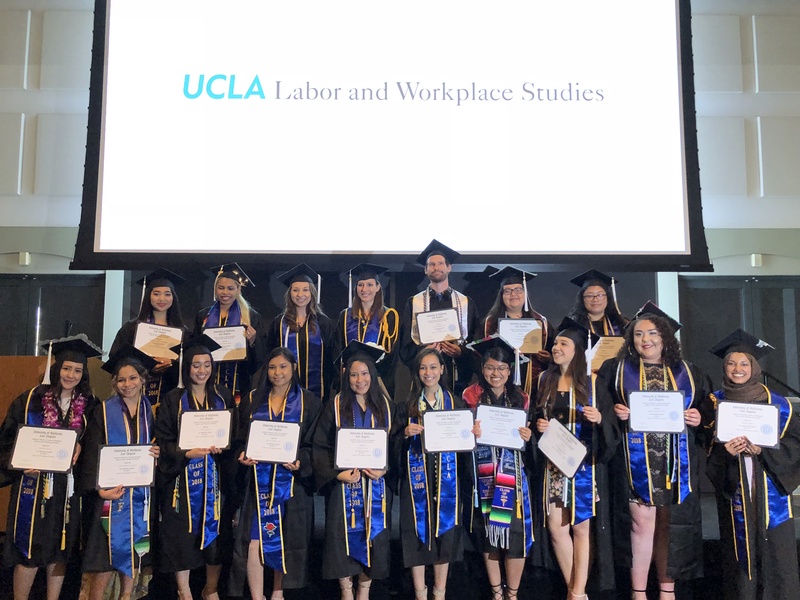 The Faculty and Staff of the Labor Studies are looking forward to celebrating with you this wonderful accomplishment! The following information pertains to the Labor Studies Commencement ceremony only. Declare your Degree Expected Term via MyUCLA. Refer to the UCLA College Commencement Website for general information and important dates. Check announcements posted to MyUCLA. Attend one of the graduation workshops offered through the College. To view the workshop schedule, visit MyUCLA and click on the “services” button at the top of the page. Complete the “College Senior Survey” available on your MyUCLA. Each student can bring FOUR guests at no cost. It is mandatory that you REGISTER and list the name of your four guests. Students and guests will need to check-in at the registration table upon arrival. Depending on how many guests are registered by all students, you might be able to bring an additional guest to the ceremony. In order to process your request, please e-mail Gloria with your name, I.D.# and the name of your additional guest. The closest parking structure to our venue is Parking Sunset Village (PSV). Please refer to the campus map. Parking passes are available for purchase from the Parking Office prior to or on the day of the event. Students or guests with disabilities should contact the Office of Students with Disabilities at (310) 825-1501 voice; (310) 206-6083 TDD, after May 3rd to receive information about parking and other assistance. You need to arrive by 1:30 p.m and check-in. The ceremony will start promptly at 2:00 p.m. Graduates will be asked to sit together in a special separate section. Light refreshments will be served right after the ceremony.